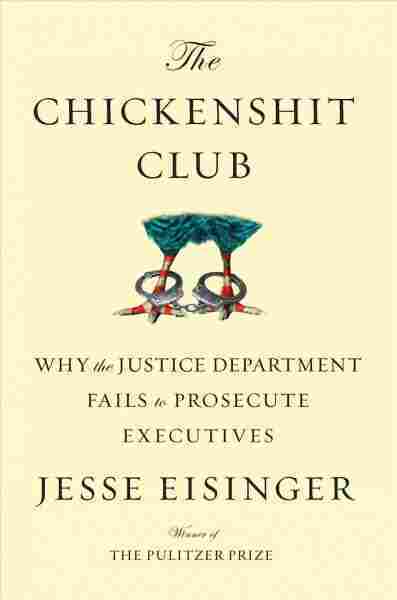 Book Review: 'The Chickenshit Club,' By Jesse Eisinger Why don't crooked corporate CEO's go to jail anymore? Pulitzer Prize-winning journalist Jesse Eisinger uncovers culture of cowardice, incompetence, and corruption in both government and finance. James Comey has become a household name over the past few months, and for good reason. Following his controversial handling of the investigation into Hillary Clinton's emails while she was Secretary of State, the former director of the FBI has become a key witness in the probe into the Trump campaign. Comey's dismissal from the FBI in May of this year — along with his subsequent Senate testimony — has placed him in a position to help uncover a scandal that threatens to eclipse Watergate. The Chickenshit Club, the latest book from Pulitzer Prize-winning journalist Jesse Eisinger, unravels a culture of cowardice, incompetence and corruption — one that has allowed the FBI, the Securities and Exchange Commission, and above all the Department of Justice to flounder in their efforts to hold not only the government, but America's financial institutions, accountable for their crimes. Comey may be the gateway into Eisinger's story, but its cast of players expands widely from there. Former U.S. attorney Preet Bharara and former Deputy Attorney General Sally Yates — both fired by the Trump administration — are placed in a broader context that sheds light on possible ulterior motives for their dismissals. But the book focuses its lens on the corporate bungling and greed of the past few years, most notably the 2008 financial crisis and its roots in Wall Street's web of risky investments and banking malfeasance — all enabled by loose regulatory enforcement, cozy Washington connections, and the implicit promise of government bailouts. Eisinger is a wonk, and gleefully he wonks out: He examines culprits like Lehman Brothers and laws like Dodd-Frank with equal fascination. But he also fleshes out the backstories of those involved — for instance, U.S. District Judge Jed Rakoff, the son of a gynecologist whose research helped develop the contraceptive pill — with all the vividness of a biographer. Did The Fed Help Banks While Ignoring The Risks? As a storyteller, Eisinger is sympathetic to his subjects, but he isn't out to make friends. Lanny Breuer, a former assistant attorney general for the Criminal Division of the DOJ, is portrayed as a showboater who, along with his boss Eric Holder, backed down from major fights against financial institutions out of a fear of political and popular fallout should they fail. As Eisinger notes, "Those who fought hard against the large corporations incurred costs, not rewards" — a frightening assessment that, while not surprising, reinforces the widely held perception that America's corporate elite have maneuvered themselves into a position of relative untouchability. The unfolding of the financial crisis makes for thrilling drama in Eisinger's hands, heightened by the anxiety still felt by all who survived it. The book is as alarming as it is comprehensive, but it's also gripping. The unfolding of the financial crisis makes for thrilling drama in Eisinger's hands, heightened by the anxiety still felt by all who survived it. He's even able to make white-collar courtroom proceedings and investigations into tax shelters sparkle. However, with new developments popping daily about Comey and others entangled in Eisinger's tale, the cursory roundup of the Trump era at the end of the book feels tacked on. Still, Eisinger is wise to contain his story to the first decade and a half of the 21st century, which gives him room to dive deeply into the nuance — and the alarming trends — of his topic. "A senior official goes rogue, as Comey did, because he doesn't have enough faith in the customs of his institution," Eisinger writes, speaking of Comey's controversial decision to announce a fresh investigation into Hillary Clinton's emails in the crucial days before the 2016 election—a move that may have cost Clinton the presidency. Eisinger makes his implication clear: The American people have become as disillusioned as Comey had in the customs of their democratic institution at large, and the symptoms are worsening. This book is a wakeup call, delivered calmly yet with no shortage of well-reasoned urgency, to a nation whose democratic traditions are being undermined by backroom dealing, deregulation, and the consolidation of corporate power. It's a chilling read, and a needed one.